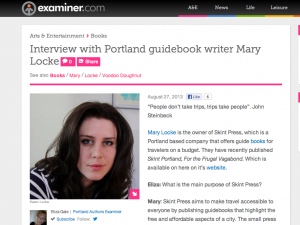 Skint Press publisher, Mary Locke, recently answered questions posed by Examiner.com writer Eliza Gale. Her answers range from expressing the Skint Press travel mantra of “making travel accessible to everyone” to release dates for upcoming editions of “Skint Portland” (pre-order here). Locke also shares the most expensive mistake travelers can make and what makes Portland a city worth sharing.